Standards for 5G – the fifth generation of mobile communications networks – have developed at an unprecedented rate, and that pace will only accelerate now the first phase of 3GPP standards for 5G New Radio (NR) have been released. This urgency is in response to the rising demands of mobile network users – whether humans or connected ‘things’ – for high speeds, rapid response times and high quality of service (QoS). To meet those demands, vendors and operators need the new 5G standards, to enhance the capabilities of 4G. But the 5G NR will not deliver all the required improvements by itself. 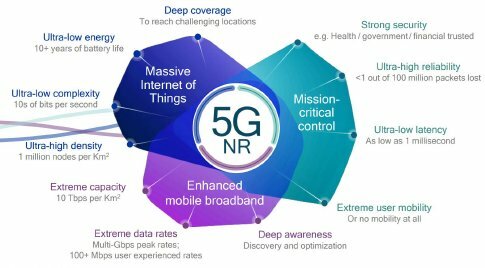 To support optimal performance for a wide variety of services, and to do so cost-effectively for operators, 5G NR will be deployed within an entirely new network architecture. Central to this architecture will be a disaggregated radio access network (RAN), with some baseband functions centralized and virtualized on commodity hardware. These baseband units will be linked to the radio units by fronthaul connections, which to date have been based on the CPRI interface over fiber. However, that solution has disadvantages – including cost and inflexibility - which threaten to cripple the 5G vRAN case. That has driven the industry to develop packet-based alternatives to CPRI, which radically change the economics of 5G virtualized RAN. The main solutions are eCPRI, and IEEE 1914 Radio over Ethernet (RoE). These both provide the flexibility to support different ways to split network processes between the central BU and the remote RU, depending on the use case. That flexibility can also greatly enhance the 5G business model. With these key developments – 5G NR, virtualized RAN and packet-based fronthaul – all converging, it is essential that vendors and operators can evaluate and measure these technologies as soon as possible, in order to reduce time to market for fully standards-based 5G networks. Comcores has made a significant contribution to this process, developing a functional RoE/5G NR demonstrator which is available today, enabled by Xilinx technology and running on commercially available hardware. This paper will outline the benefits of a packet-based fronthaul technology to the business case for 5G NR virtualized RANs, and describe Comcores’ demonstrator. This provides detailed measurements based on four important enablers of the new RAN architecture - 5G NR; 100 MHz channels; IEEE 1914.3 RoE encapsulation and mapping; and functional splits which offload some of the baseband processing to the radio unit in order to boost fronthaul efficiency still further. There is also a coexistence path with installed CPRI links, and the eCPRI roadmap. These technologies will have a profound impact on 5G deployment economics, and that impact can start to be measured and modelled today, thanks to demonstrators like that of Comcores. The International Telecommunication Union (ITU) will select the official technologies for the fifth generation of mobile communications networks – IMT-2020 – later in 2018, but the inclusion of the latest 3GPP radio standards is a foregone conclusion. The specifications for IMT-2020 require higher data rates, lower latency and higher connection density than those of its predecessors. 3GPP’s 5G New Radio (NR) and 5G Core Network (CN) standards address those requirements, promising end user data rates above 10 Gbps, air interface latency below 1 ms, and the ability to support over one million connections within an area of a single square kilometer. These specifications will be important to address the wide range of use cases which has been identified for 5G networks. In order to justify investment in a new generation of technology, service providers need their networks to support a greater diversity of revenue streams than 3G and 4G did, including many applications within the Internet of Things (IoT). These often require support for huge numbers of devices as well as low latency. Figure 1 summarizes the three key service requirements for 5G - Enhanced Mobile Broadband (eMBB), Ultra-Reliable and Low Latency Communication (URLLC) and Machine Type Communication (MTC). The first phase of 3GPP Release 15 specifications for the 5G New Radio (NR) are focused on a non-standalone (NSA) implementation, which relies on the existing 4G network for control plane traffic and core network connection. The first priority for 2018 will be on specifying a full standalone version, while additional enhancements, such as support for shared spectrum, will be addressed in Release 16 (expected in late 2019) and subsequent Releases. The release plan timeline can be seen in Figure 2. LTE only supports a single transmission numerology and up to 20 MHz channels (100 MHz with 5x20 MHz Carrier Aggregation for LTE-A). In NR, by contrast, five different transmission numerologies are defined with subcarrier spacing up to 240 kHz and single channel bandwidths up to 400 MHz. The NR will support advanced beamforming and Massive MIMO antenna techniques to improve capacity, range and flexibility. To do this, NR is moving towards a more user-centric design with control and reference channels being fully UE-specific rather than cell-specific as in LTE. Low latency transmissions are supported in NR with the introduction of mini-slots and preemptive scheduling, so that small transmission resources can be immediately allocated for latency critical services without any pre-reservation. There are many innovations in 5G NR to support the new requirements, but implementing NR – to enhance or eventually replace 3G and 4G – will not be enough on its own. Operators are faced with stagnating consumer revenues and rising demands to deploy more and more capacity. That means they need to reduce the cost of that capacity dramatically, while supporting new revenue streams that require very specific levels of latency, density, reliability and data rates. To achieve all that on a single network means the wireless industry has to engage in a complete rethink of its current base station architectures. In particular, that rethink is focusing on centralized and virtualized radio access networks (RANs). There have been moves towards centralized RAN before – basebands shared by several radio units (RUs), or base station hotels. But in the 5G era, operators are looking to share resources between a far larger number of RUs, and to introduce virtualization and software-defined networking (SDN) techniques. They allow network resources to be shared, and allocated flexibly, across a large area, to increase efficiency and target capacity where it is most needed. Processing and capacity resources are pooled, and logical nodes can be configured, scaled up or down, and reconfigured in software, improving responsiveness. They implement some or all of the baseband processing in virtual network functions (VNFs), which are deployed as software on shared, generic hardware, such as servers or white box switches. This reduces the use of proprietary, integrated hardware and reduces capex and OPEX costs. Operators will make different choices about the split between physical and virtual network functions, depending on their business case. They split RAN functions, including separating the user plane (UP) and the control plane (CP), to support the flexibility and responsiveness required, especially in URLLC applications. Figure 3 provides an example of a virtualized RAN architecture. One of the most critical elements of the new centralized and virtualized RAN architecture is also the most challenging – the connection between baseband and radio elements, known as fronthaul. This will entail some of the most demanding performance requirements ever encountered in the mobile network, in terms of latency and data rates. The requirements of the fronthaul connection will be heavily influenced by how functions are split between the centralized, virtualized baseband unit (BU) and the RU’s at the cell sites, in a virtualized RAN. Splitting the radio protocol in two poses serious challenges to the fronthaul because bandwidth, latency and complexity levels vary according to the location of the split. The eCPRI project has proposed five possible functional splits, while 3GPP has specified eight, with different balances between the BBU and RRU to suit different traffic patterns and business cases, while retaining a standards-based approach. It is expected that a subset of those splits will be adopted in commercial systems. Figure 4 shows a breakdown of the RU/BU functional split proposals from 3GPP and eCPRI, where the overlaps between the two models are highlighted. Each split will have different implications for the fronthaul requirements. For instance, the more BU functions can be offloaded to the RUs, the more that will reduce the load on the fronthaul link, by decoupling L3/L2 from L1.Using Radio over Ethernet (RoE) as the transport protocol between the two will enhance efficiency and flexibility.However, a distributed approach will come with some trade-offs in terms of how widely resources can be allocated across a large network, compared to a heavily centralized and shared BU. In all cases, operators will need to find a difficult balance between performance, flexibility and cost-effectiveness. Regardless of which functional splits gain a broad commercial foothold, it is clear that the underlying fronthaul network must be able to support many different options. However, this complicates the standardization of a fronthaul transport protocol. Over the past five years, different standards and protocols for fronthaul transportation and interfacing have emerged. Since it appeared in 2013, CPRI (Common Public Radio Interface) has been the de facto standard for point-topoint fronthaul transport for macro base stations. However, its bandwidth and flexibility limitations will become very challenging once operators start to introduce highly demanding eMBB, URLLC and MTC services. CPRI was defined to connect the RU and the BU over distances of up to 20 km using a bidirectional point-to-point topology over fiber. It carries the synchronization, I/Q antenna data and OAM information in a TDM (time division multiplexing) fashion between the two. This approach entails dedicated fibers, which can make fronthaul very costly, especially for operators which see cost efficiency as a primary driver to deploy a vRAN. Other shortcomings of CPRI over fiber are inflexibility, low transmission efficiency, and limitations in OAM protection capabilities. These disadvantages have been a significant barrier to early deployments of vRANs, but with 5G approaching, a new base station architecture is becoming essential, not optional. This has led to a paradigm shift in fronthaul network design, targeting greater flexibility and efficiency by moving to a packet-switched network using the mature and widely available Ethernet as the transport base. Within packet-based fronthaul, the dominant standards to emerge are IEEE 1914 and eCPRI . In the former, the 1914.3 RoE specifications provide the “Standard for Radio over Ethernet Encapsulations and Mappings” . By defining encapsulations of radio data in Ethernet frames, this makes Ethernet fully usable as a fronthaul transport in a carrier-grade environment. An overview of Fronthaul protocols and standards is shown in Figure 5. In addition, other research has been focused on solutions that reduce the bandwidth required for fronthaul, and that achieve the multiplexing gain of packet-switched networks. In the first release of this standard, three mapping methods are defined - structure agnostic; structure aware; and native mode (native mode contains two sub-mapping methods for different splits). Figure 6 shows a conceptual model of fronthaul deployments using the different RoE modes. Structure aware and agnostic modes were defined in order to ease the evolution towards packet-based fronthaul by allowing it to be inserted into existing CPRI-based systems without any modifications to the BU or RU. The native modes, on the other hand, require changes to the hardware but will result in a more efficient fronthaul. To address some of the limitations of CPRI, the companies behind that standard released eCPRI in August 2017. This defines a general framework for transport of radio data over Ethernet. eCPRI is a L3 (and above) protocol relying on e.g. Ethernet MAC and PHY functions. The protocol stack is shown in Figure 7. The synchronization and C&M (control and management) planes are not covered by the eCPRI protocol and therefore rely on existing methods such as PTP or SyncE. Although eCPRI is a relatively open framework, key elements remain vendor specific in the way they are implemented, which will limit multivendor interoperability. For instance, for the user plane 256 eCPRI message types are defined, but only the first eight have fully common formats1. The others are either reserved or have vendor specific usage. And for all message types, the actual usage of the defined fields within the message is vendor specific. This means that, for two eCPRI end nodes to communicate successfully in a packet-based fronthaul network, the same implementation of the protocol must be used (or at least there must be a shared understanding of how to interpret the vendor specific fields). The previous sections have outlined how 5G NR standards, vRAN architectures, and packet-based fronthaul are converging to enable a new mobile network. However, these are all still emerging technologies, and to build confidence and understanding, it will be essential for industry stakeholders to be able to test, evaluate and measure their performance in advance of commercial deployment. In this chapter, we will describe the RoE/5G NR fronthaul demonstrator developed by Comcores. This provides one of the industry’s first functional RoE demonstrations, which allows measurements to be performed with NR and 100 MHz channels. This is an important step to understanding real world performance of virtualized 5G RANs and the choices available in implementing them. Specifically, the demonstrator showcases how fronthaul bandwidth requirements can be dramatically reduced by moving some of the lower processing layers of the radio protocol from the centralized BU out to the remotely placed RUs. The platform is a board-to-board demonstrator showing several key aspects of RoE. It is based on two Xilinx VCU108 evaluation boards, featuring a Xilinx Virtex Ultrascale FPGA (field programmable gate array), which can be programmed to act either as a baseband gateway (BBU GW) or as a remote radio head gateway (RRH GW). A detailed overview of what is included in the two platforms is shown in Figure 8. Test equipment comes from Rohde & Schwarz and Sarokal. The demonstrator showcases Comcores’ combined IP for RoE, L1 offload, 5G NR baseband processing, and 25G TSN (Time Sensitive Networking) Ethernet. It uses a frequency domain, native mode RoE mapper/de-mapper IP, together with a 5G NR L1 offload IP. 5G NR-compliant 100 MHz OFDM baseband modulators are implemented on the RRH GW in the L1 offload IP. Fill out this form for contacting a Comcores representative.